Spring has sprung and that means that the Quad Cities Builders & Remodelers Spring Parade of Homes is almost here! We wanted to give you a sneak peek into one of the parade homes you are going to fall in love with in 2019. This incredible open-concept kitchen design is a dream space in the Applestone Homes QC parade stop this Spring. We are thrilled to have the opportunity to partner with Applestone Homes on their projects because they are so refreshingly creative with their details and home layouts. The homes they are building in the Quad Cities are so exciting! 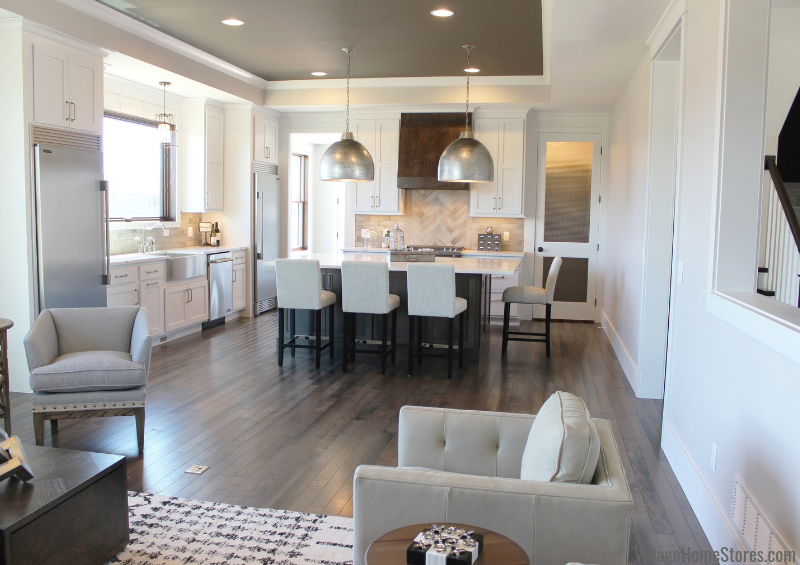 In this parade home we provided the cabinetry and countertops for Applestone. Our Koch Classic Cabinetry line is a wonderful cabinet choice for any style of space. This Transitional-styled kitchen uses a classic flat-panel door from Koch named “Savannah” in a Maple wood for the perimeter of the cabinet design in a painted “White” finish. A large window above the kitchen sink helps to bounce light off the white cabinet and countertop surfaces. Applestone Homes Quad Cities open concept kitchen with stainless farmsink. 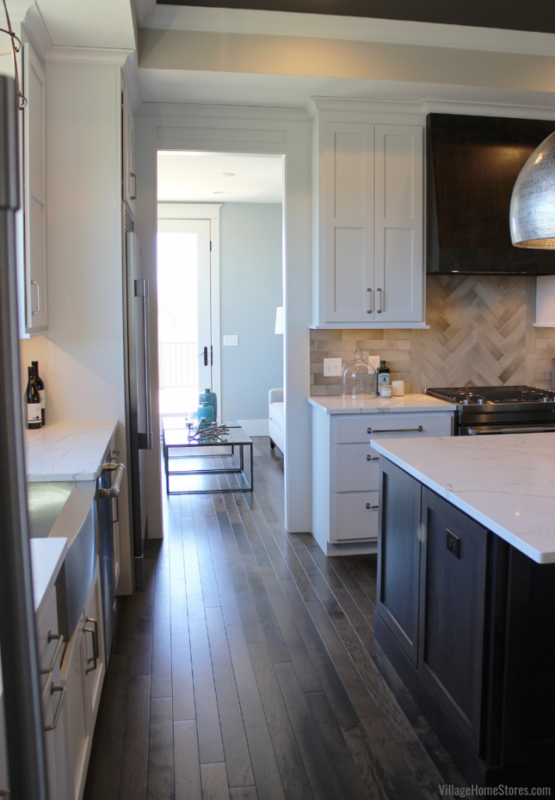 Kitchen featuring painted white cabinets and marble look quartz counters from Village Home Stores. The window wall is home to the farmhouse kitchen sink, dishwasher, and divided fresh and frozen food storage. Using a modern material like Stainless Steel on a farmsink helps to lean the style of the kitchen back away from rustic style to a more updated, modern farmhouse look. 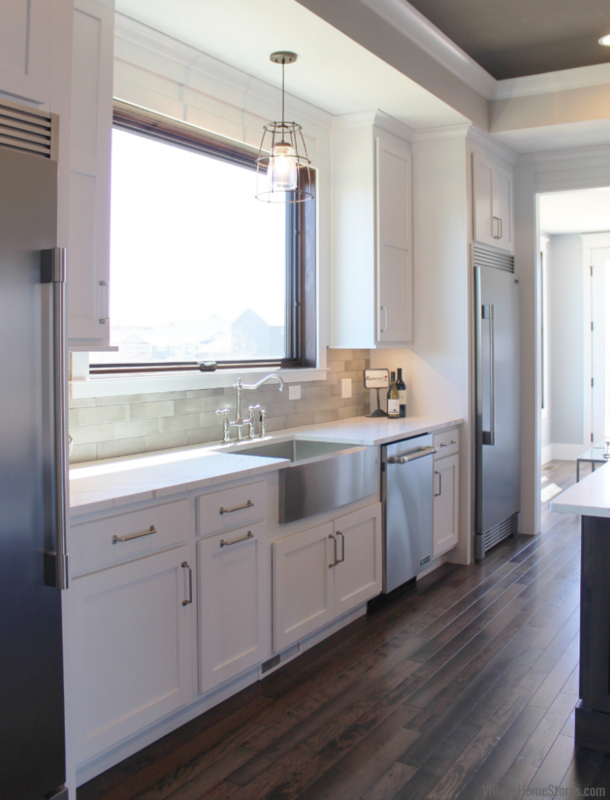 The overall look of this kitchen is so clean and inviting. It looks upscale but it is still approachable and welcoming. 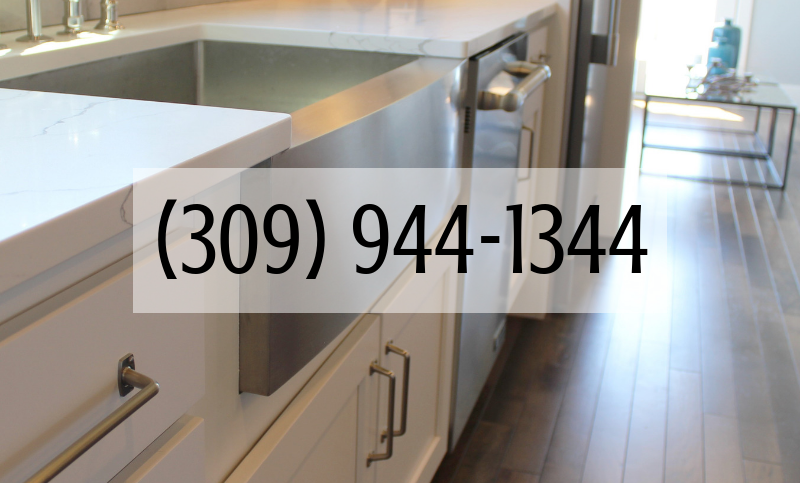 Open concept kitchens are perfect for entertaining and you want everyday users and guests to all feel comfortable. This kitchen and living room space definitely checks all of those boxes! One of our favorite elements to this kitchen design is a room Applestone added just within reach of the kitchen. Who wouldn’t love to enjoy their morning coffee in this adjacent sitting room (shown below)?! Scratch that-we would love to enjoy morning coffee, working from home, cocktail hour, golden hour…. you get the point. Applestone Homes Quad Cities open concept kitchen with nearby sunroom. 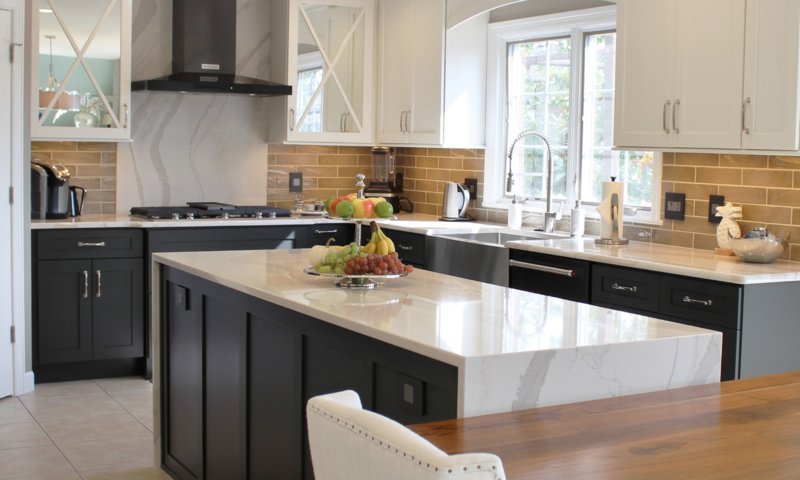 Kitchen featuring painted white cabinets and marble look quartz counters from Village Home Stores. 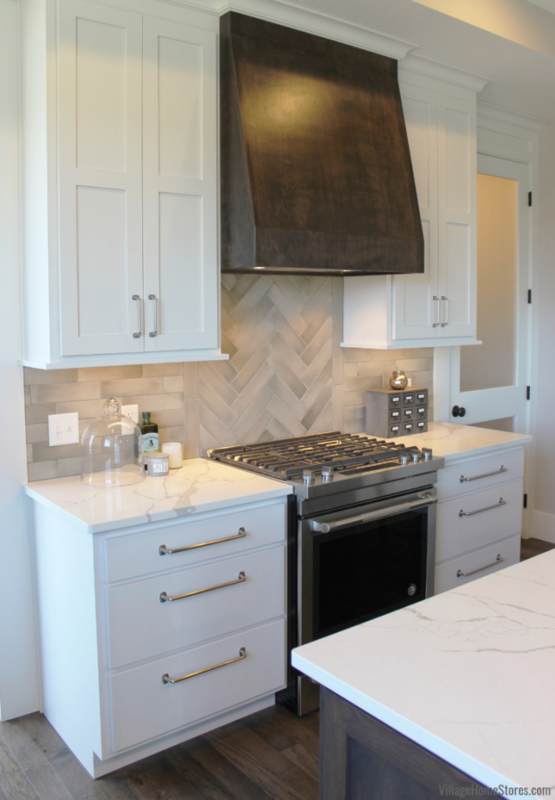 Installing flat-panel, white cabinetry creates a minimal gallery effect for the statement details in the overall kitchen design like this incredible hood! This wall may have visual focal point with the hood but it adds so much value for the homeowner because of the storage. 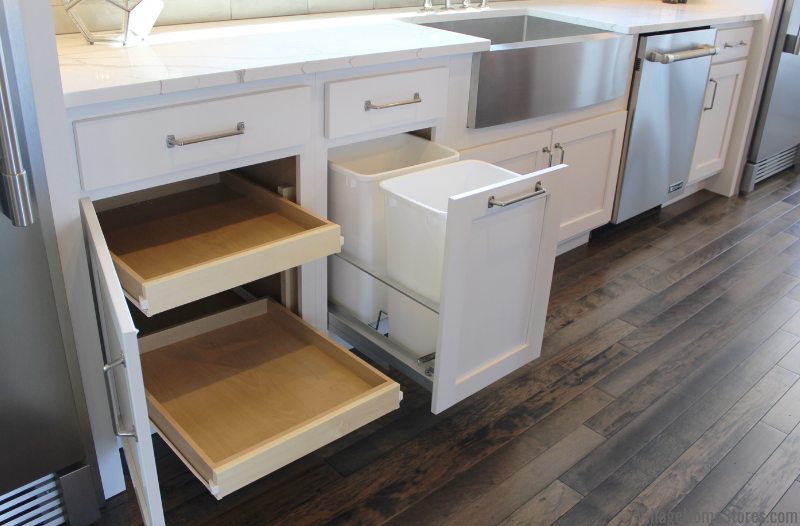 In place of doors that open up to fixed or sliding shelves, we have included large drawers. Large drawer stacks like this are wonderful for prep zones of a kitchen design. The drawers are built to hold the weight and capacity for pots and pans storage as well as small appliances. In this Bettendorf, Iowa home we have included one on each side of the range to keep the wall symmetrical in design and keep the focus on the hood. Quad Cities Spring Parade of Homes kitchen from Village Home Stores in a stunning Applestone Homes QC home. See this space in person during the 2019 QCBR parade. Speaking of storage, this kitchen has it everywhere! Notice in the image above that we have included wall cabinets that stretch to the ceiling instead of standard 30″ cabinets. You may need a stepstool to reach that top shelf but any homeowner will appreciate the extra space once they move into this kitchen. We have also included slide out shelves in the smaller base cabinets as well as a double bin pullout waste basket cabinet. Why a double bin? So your household can sort recycling and standard waste as you dispose of it. Painted white Koch cabinetry with sliding shelves and pullout trash. 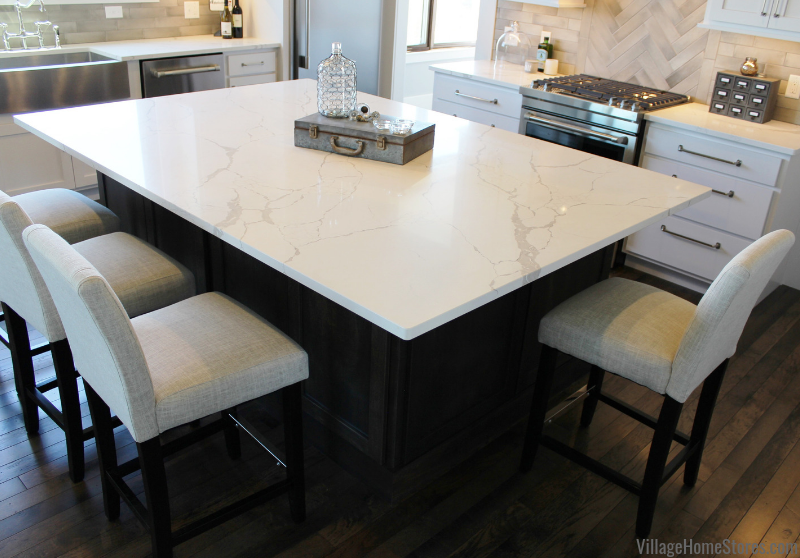 Kitchen design paired with quartz counters from Village Home Stores. Village Home Stores designs kitchens that look great and kitchen designs that function well for the users! We even included hidden storage on the back of the kitchen island. Store bulk items, seasonal and entertainment items, platters and extra glassware, whatever your heart desires all out of sight beneath the kitchen island countertop overhang. Press play below to see what we mean. Of course the front side of the kitchen island is functional as well. Drawer and door storage cabinets and a drawer beneath a microwave. 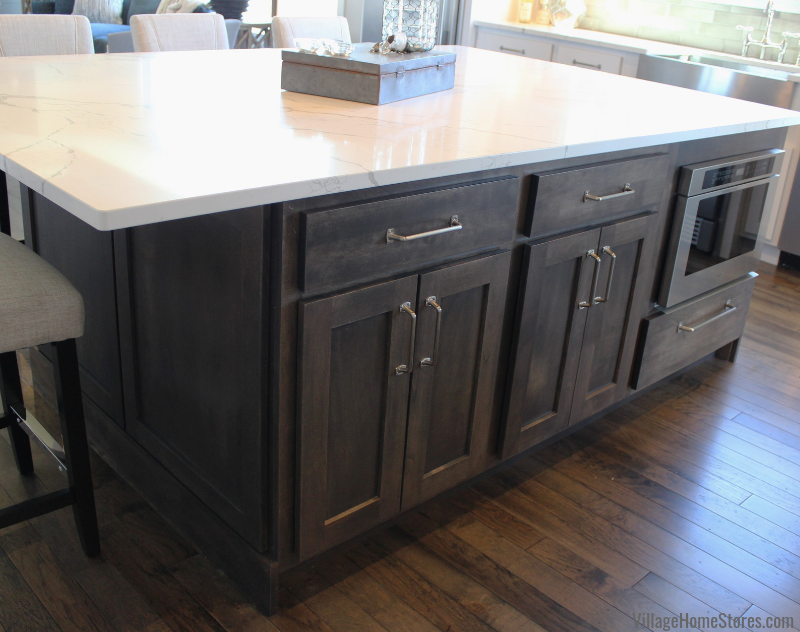 The same “Savannah” door is used on the kitchen island. This time in a Birch wood with the “Stone” stain applied. We also used this Stone stain in the bathrooms and lower level bar area of the home. We didn’t want to show you all of this home in a blog feature. You are going to have to visit this home during the parade to see those spaces. You will love this entire home. Stone Gray stained Koch cabinets and Quartz kitchen counters . Kitchen cabinetry and counters from Village Home Stores for Applestone Homes Quad Cities. The kitchen island also boasts a wonderful large surface perfect for food prep, entertaining, casual dining, and more (just watch your head with those lights if you use it for a dancefloor). The look of marble with the maintenance-free appeal of quartz. These tops from our Q-Quartz line are the perfect material selection for any busy open-concept kitchen. If you want to learn more about Applestone Homes you can follow them here on Facebook and here on Instagram. Marble look Quartz kitchen counters. 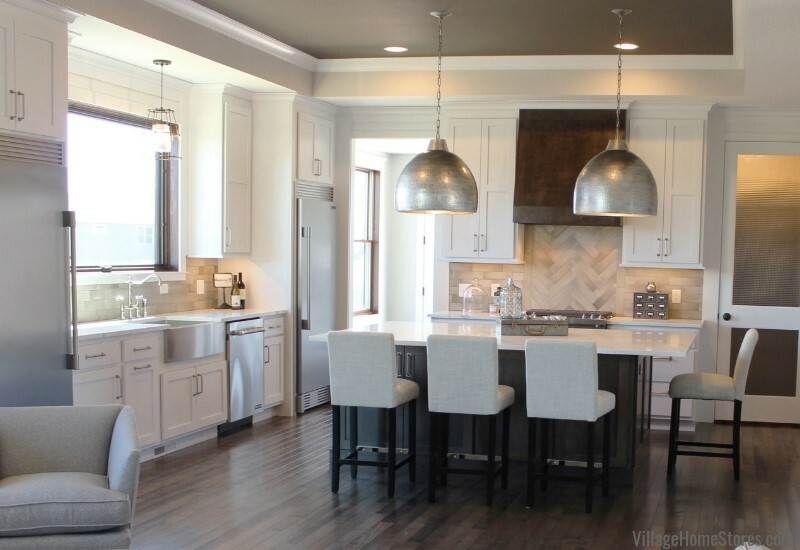 Kitchen design, cabinetry, and counters from Village Home Stores for Applestone Homes Quad Cities. Find a full map and details about the 2019 QCBR Parade of Homes online at their website or find printed guides at all local area HyVee locations. The 2019 QCBR Spring Parade will take place on 4/27, 4/28, 5/4, and 5/5 from 1-5pm and on Wednesday 5/1 from 5-7pm. 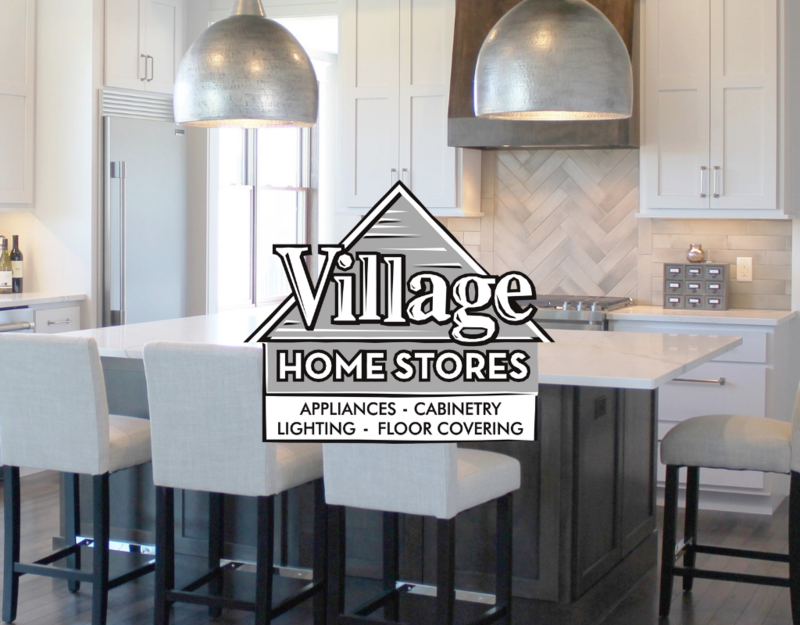 To learn more about Village Home Stores and our new home product estimating process visit villagehomestores.com or stop by and see us at 105 S State St in Downtown Geneseo. We promise shopping with us saves you time and money for your new home. Our one-stop-shop is worth the trip.